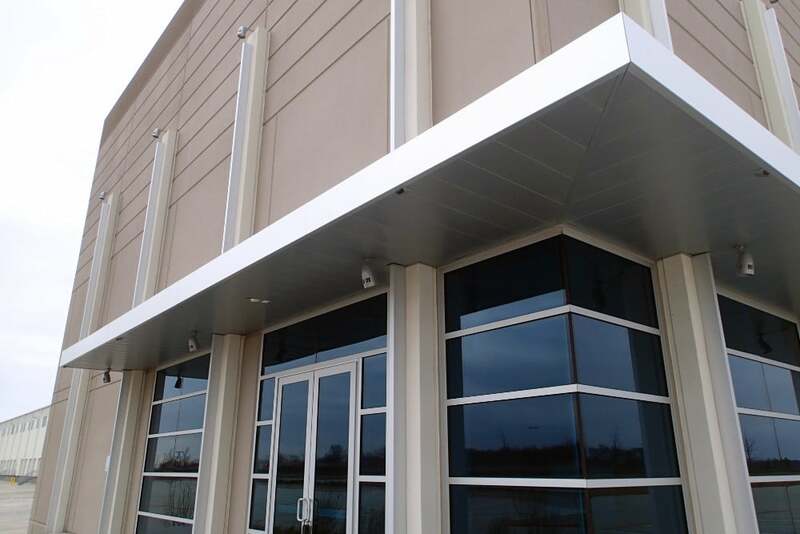 The GC on the DFW Commerce project, FA Peinado Construction (Peinado), was looking for a provider to fabricate and install aluminum canopies and sunshades. Peinado specializes in industrial, manufacturing, distribution centers, medical, & data-centers; this experience allows them to provide realistic estimates plus knowledgeable design. They are responsible for the construction of approximately 40 million square feet of “tilt wall” facilities in Texas. Architectural Fabrication designed, fabricated, and installed our Extruded Aluminum Sunshades and Atlas Aluminum Canopies with a 6” fascia. With the distance between columns spanning 14 feet, we were not able to span the distance with 6” airfoil and there was no “structure” to attach the sunshade outriggers to. We provided our own “structure” in the form of a 12” x 12” alum tube that was installed between columns, giving an attachment point for additional outriggers. DFW Commerce was designed by Powers Brown Architecture (PB) firm. Led by founding principle Jeffrey Brown, the firm has built a reputation for innovative designs balancing function, aesthetics and construction technology. PB is closely involved in the relationship between architecture & construction; striving to invent methods to apply award-winning design with commonplace construction methods.